As a professional coach I have been trained in accordance with the International Coaching Federation (ICF) competencies. This enables me to provide the best coaching experience for my clients and support them to make the changes they desire through coaching. 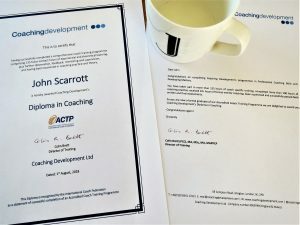 I am a formal graduate of Coaching Development‘s Accredited Coach Training Programme achieving the Diploma in Coaching. This qualification is recognised by the International Coach Federation, the only globally recognised professional coaching body. My training involved: 125 hours+ coach specific training, 100 hours+ coaching experience, 10+ hours of formal mentor coaching, supervision and passing written and final assessments. I hold an ACC (Associate Certified Coach) credential, issued by the ICF (International Coach Federation). I work to their set of coach competencies and their code of ethics and conduct. I am the Presentation trainer and coach for The Institute of Direct and Digital Marketing and the coach for members of the Association of Association Executives. My coaching supports you to make progress towards your goal. Get really clear about what it is you want and don’t want. Figure out what is standing between you and getting what you want. Understand how to get around the barriers. My style of coaching is to create a series of dynamic conversations that support you to get clear about your goals, find what you need to move forward and build your confidence to execute the plan successfully. In order to create these conversations, I will ask questions, listen and give feedback on what I’ve heard. “John’s coaching has made a genuine difference to me, personally and professionally. The opportunity to vocalise my thoughts gave me a different perspective on them.” Design professional.